Cervical cancer can sound very scary, but thankfully, it is one of the few cancers that is almost entirely preventable. We have gathered some information to help you avoid cervical cancer. If you are in need of complete women’s healthcare, call Chicagoland Complete Healthcare to set an appointment today. We have the knowledge and experience to help you live your best life. In order to properly reduce your risk of any type of cancer, it is imperative to know what causes it to develop. As the top cause of cervical cancer, HPV should be on your radar. Human papillomavirus, or HPV for short, is a sexually transmitted disease, though it is not the only cause to be aware of. Tobacco smokers are twice as likely to contract cervical cancer as non-smokers. A Pap test is conducted when your gynecologist takes a sample of your cervical cells and looks for cells that could become cancerous. Though these precancerous cells may never become an issue, early detection is one of the best weapons we have against cancer. It is always better to find out early and have it be nothing than to ignore it and let cancerous cells grow. The American Cancer Society advises women to get a Pap test starting at age 21, and every three years after that until they turn 29. From there, it’s recommended to get one every three to five years through age 65. If you are over 30, this may be an option for you. If your Pap test results come back with an irregularity, your doctor may administer this test to search for HPV. If this test shows HPV is present, your doctor will monitor you closely for any signs of cervical cancer developing further. The same cells that were used for the Pap test can be used for the HPV test, so many times, your doctor will perform both tests simultaneously to ensure they get as much information as possible. One of the most important steps to take to avoid cervical cancer is to get the HPV vaccine. It has shown incredible effectiveness against the most dangerous strains of HPV, types 16 and 18, which cause more than half of all cervical cancer diagnoses. It is recommended, for both girls and boys, that the HPV vaccine is given prior to becoming sexually active, and it is available once they are 11 or 12 years old. Women are able to get the vaccine up until they turn 26, though a new vaccine is being developed for women older than this. Men are typically unable to get this vaccine after they turn 21, though, it can depend on the specific situation. In the event that you are already sexually active and/or you are too old for the vaccine, the number one step you should take is staying on top of your doctor visits. They will be able to monitor your status and risk levels, helping you stay aware of what could develop as early as possible. Additionally, since there are over 100 kinds of HPV out there, reducing the number of sexual partners you have will help you reduce your risk as well. Maintaining a healthy weight with a solid diet of fruits and vegetables will ensure your immune system is strong enough to fight viral infections. Whether you are currently a smoker, or you recently were, it’s important to kick the habit to avoid cervical cancer. Depending on the type of birth control you use and if it fits into your family planning strategy, it can help with prevention if you don’t use it for an extended period of time, though this is something you will need to consult your physician about. As with all sexually transmitted diseases, it is always recommended you use a condom to prevent transmission of HPV. Early detection and prevention are the first line of defense against cervical cancer. 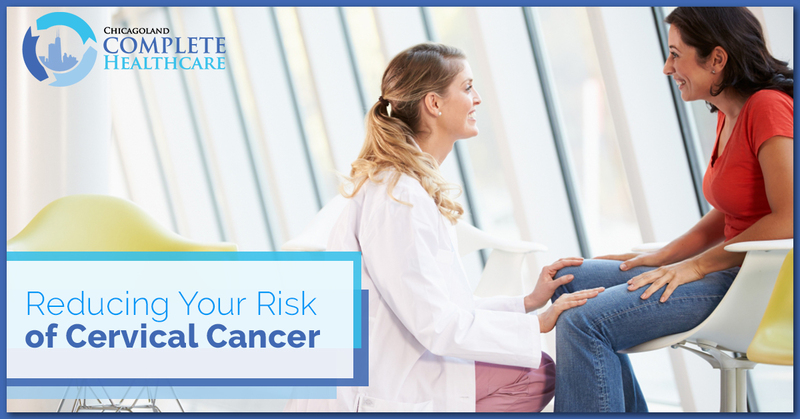 Consult with your doctor to see what your options are to reduce your risk so you can avoid this preventable cancer. If you’re in the Chicagoland area and you need high-quality women’s healthcare, call Chicagoland Complete Healthcare. You deserve a happy and healthy life; let us help you get there.